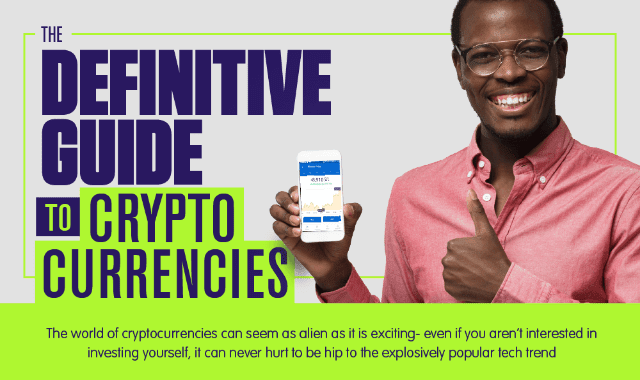 Definitive Guide to Cryptocurrencies #Infographic ~ Visualistan '+g+"
What is cryptocurrency? You have probably heard of Bitcoin, but that is one of dozens, if not hundreds, of cryptocurrencies available out there. And how do you even buy it? There are multiple different ways to buy cryptocurrency, and you can also invest in cryptocurrency funds called ICOs. There are exchanges just like stocks, and you will have to learn the differences between hot wallets and cold wallets to protect your cryptocurrency. But even when you figure all this stuff out, what’s the point? The whole point of cryptocurrency is to decentralize the banking system and take control from the few and give it to the many. With cryptocurrency you have the ability to invest in a more open and free society, though you should know that at least in the United States you will still have to pay taxes on your capital gains, and if you get paid in cryptocurrency you still have to pay income taxes on it. Learn more about the ins and outs of cryptocurrency from this definitive guide to cryptocurrency!